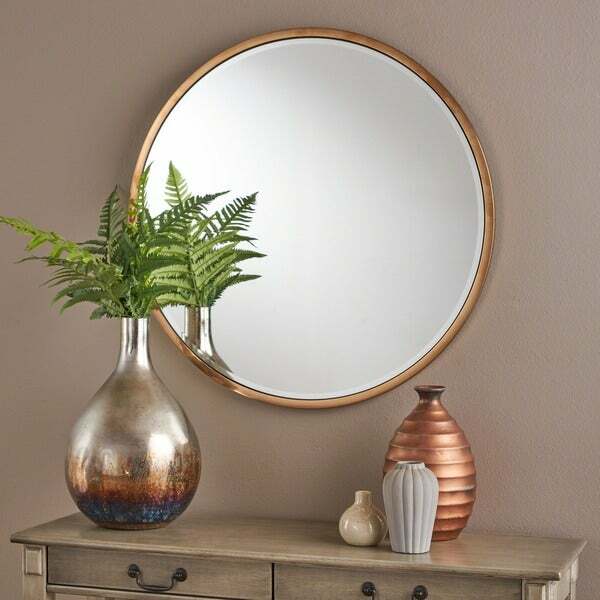 This gorgeous circular wall mirror with a rose gold frame will open up any interior space. Large enough to be useful but not so large as to be ostentatious, it is the perfect addition to your home. Made from durable materials according to the highest qualities of craftsmanship. Love it! We hung this in our entry over an entryway bench and it completed the look. The color is very vibrant and the piece is heavy and good quality. Lots of compliments on this. It is large enough to take up a whole wall which is what we were looking for. 5 stars. I was looking for a circular gold mirror to go over my entry way table. The circumference is what caught my attention, other than the simplicity I was wanting. I believe it is 32" and just the perfect fit. Shipped right away and I fell in love the second it was hung. 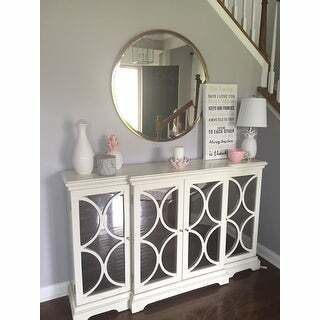 Similar mirrors that I have found at Pottery Barn were 3x the price. Love this purchase. Nice large mirrors. The frame is definitely a rose gold and will have to be painted to match my other fixtures. Difficult to tell the color from the pictures. 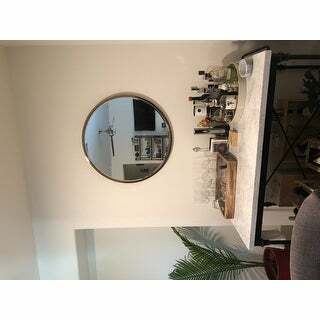 Love this mirror! The perfect size for my single sink bathroom vanity (55 inches long). I get tons of compliments! 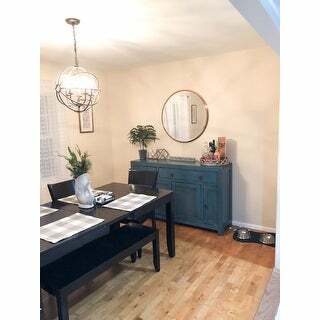 I plan on order another one to go over my dining room sideboard. This mirror is really lovely. The gold is lovely next to gold or rose gold. Blends nicely. But is definitely not a classic soft gold. I keep debating to return it though because the frame has a very small dent. It is hard to get a picture of it but it is noticeable at sight it in the light. But otherwise it is perfect so I’m not decided yet. Beautiful, quality item. 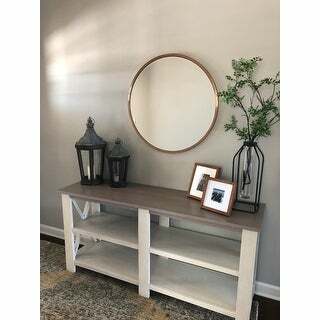 It's the perfect size and style for my small entryway. I aligned the top of it with the top my my doorway, and there was room underneath for a coat hook rail that was low enough for my 4-year-old to reach and high enough that an adult coat doesn't drag on the floor. The color is more rose gold so if you’re looking for a true gold, this isn’t it...It’s well made & a heavy piece...It looks more expensive than it is...I’m using it as a mirror above my vanity in my guest bathroom. Beautiful quality and addition to my bathroom update. Was looking for a high quality mirror with an actual metal rim that felt and looked like metal. Looked for 2 months basically - this was the cheapest one around. Love how it looks on top of my dresser. I bought this for my client's bathroom. Love it. Good quality. But Its more like roae gold finish . Perfect! Changed the entire look of our room! Reached on time , packing was great and it was intact. OMG the mirror looks awesome. I have put it in my dinning area and it looks amazing, looks much pricey than I have paid . The frame looks awesome, kind of bronze but I am very pleased. Awesome! Easy to hang, substantial and gorgeous! Perfect for my bedroom project. Was sent rose gold instead of gold. Didn't notice until we hung it up and then saw on the box it was the wrong one. Not worth the effort of shipping it back. "How heavy is the mirror?"